ATHENS — The number of killed in the devastating fires near Athens was revised upward to 74 on Tuesday afternoon, while the search for more victims continued in Attica’s eastern coast, Greek national news agency AMNA reported. The number of injured stood at 187, according to the latest official announcement by the fire brigade press spokesperson Stavroula Mallidi. A still unclear number of persons was missing. Earlier, Greek Prime Minister Alexis Tsipras called for three days of national mourning, pledging that the victims will not be forgotten and fire-stricken survivors will not be left without help. The country faces since Monday one of the deadliest blazes in more than a decade. Most casualties were reported at the seaside resorts of Neos Voutzas and Mati, some 35 kilometers east of the Greek capital, as people got trapped in the flames or drowned while trying to escape by swimming at the sea. At least 715 persons were transferred to safety to the nearby port of Rafina by dozens of Greek Coast Guard vessels and private boats, authorities said. Some 1,000 houses and 300 cars have been destroyed, according to initial estimates by local authorities. Eastern Attica has been declared in state of emergency as well as western Attica, where a large fire also burnt a pine forest and dozens of homes near the resort town of Kineta, 50 kilometers west of Athens. A third blaze at Kalamos resort town to the north which broke seven hours after the first fire at Kineta, also forced hundreds of people to flee their homes. All blazes were partially put under control by Tuesday, but firefighters were still battling flare ups, according to the Fire Service. At least 47 fires broke out across Greece on Monday and Tuesday, the Fire Service said. 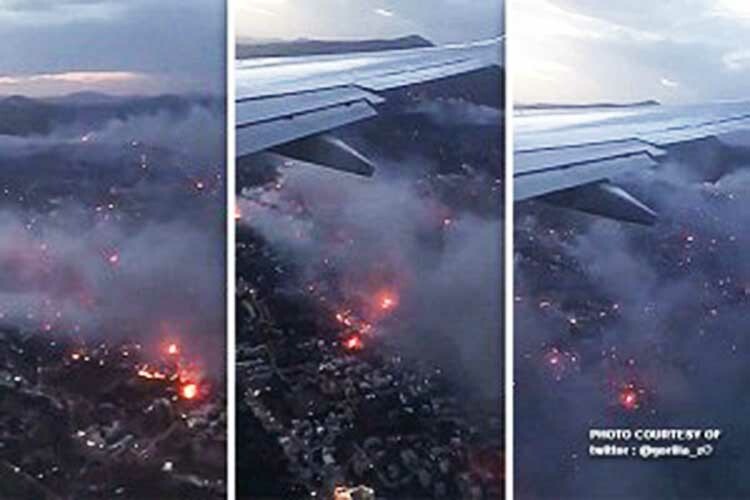 The Greek government has raised questions about arson, as fires started in many sites in parallel as winds reaching up to 9 on the Beaufort scale were blowing in the area. Greece has received messages of condolences and offers of support to address the crisis from across the globe, the government said.